Jambo! Our safari continues. Our day started before dawn and it was well worth the lack of sleep to watch the majestic sunrise of the Ngorongoro Crater, which is a UN World Heritage Site and what many people call the eighth wonder of the world. The Ngorongoro Crater lives up to all our expectations, with a 10 by 12 miles sea of beauty. Our hunt for the “Big 5” proves very fruitful. Today we saw lions, cape buffaloes, rhinos and more elephants. All that we lack is the elusive leopard. When we first spotted the pride of lions they were getting ready to hunt. Unfortunately, they were interrupted by five buffalos that walked within 5 feet of the pride of lions and had a 10 minute standoff. Our guide David told us that the buffaloes wanted to kill the two cubs in the pride. 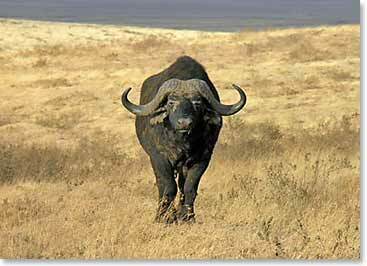 Eventually the buffaloes gave way to the King of the Jungle.